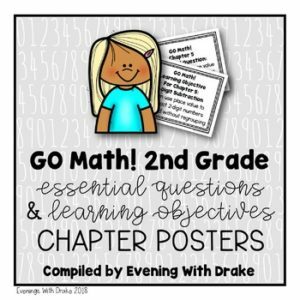 This teacher resource contains a set of Chapter Essential Questions and Chapter Learning Objectives for the 2nd Grade California Edition of the 2015 Houghton Mifflin Harcourt GO Math! Mathematics Program. *All posters and anchor charts have been produced using the “landscape” orientation (11 x 8.5). *REMINDER: This poster set is for the CHAPTER essential questions and CHAPTER learning objectives only. *Feel free to hang these posters on whiteboards, classroom doors, a math focus wall, or any other prominent place where they can be easily seen and utilized. *SUGGESTION: Copy the posters back-to-back (2-sided) to make a lesson objectives or essential questions “book” for your kiddos. TIP: Add lined or blank paper between posters so that students may write or sketch pictures about what they’ve learned after the instruction of each chapter. Thanks so much for your interest in this freebie!